When it comes to kosher salt, the crystals make all the difference. Our kosher salt was developed over 100 years ago using a proprietary evaporation process that creates unique hollow, multifaceted salt crystals; fragile enough to crush between your fingers - perfect for controlled seasoning in the home or a foodservice setting. The kosher salt crystal shape influences many of its functional properties, including its adherence to food surfaces - bringing out every dish’s full flavor. 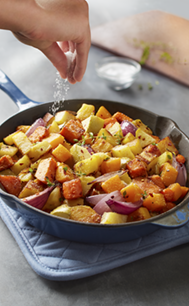 For home cooks and foodservice operators who enjoy seasoning control, Diamond Crystal® Kosher Salt is the ideal salt. 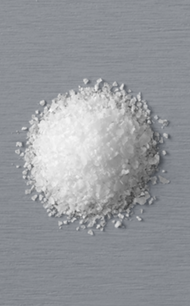 Diamond Crystal® Kosher Salt has a much larger flake size than regular table salt and contains no additives. 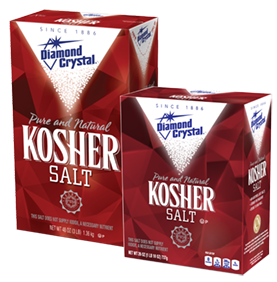 Diamond Crystal® Kosher Salt is distinct from other kosher salts because of its extraordinary texture and smooth blendability. Use it for all of your cooking needs, as Diamond Crystal® Kosher Salt’s hollow shape dissolves and disperses flavor quickly. Taste® Magazine published an article that speaks to the benefits of Diamond Crystal® Kosher Salt: "The Kosher Salt Question." Also, Esquire® Magazine published an article, “The Esquire Guide To Salt," where Diamond Crystal® Kosher Salt is the recommended utility salt. No other kosher salt is like it. No additives. Only pure kosher salt.